Immediately after the game Karjakin-Anandin round 13, in which Anand scored the important draw he needed to clinch home the Candidates 2014, hundreds of of “Congratulations, Vishy” tweets popped up in my Tweetdeck. I don’t want to quote all the “Tiger of Madras, “Eye of the Tiger” and “Roaring Tiger comeback” tweets, but I know that Vishy enjoys and appreciates every single tweet. Here is a selection of tweets from well-known players, organizers and fans. You can find the whole article here: http://culturama.in/13966/. The picture that goes with the article was made by your blogger, in Sofia 2010. In my picture archive I found a very nice old shot by Boris Dolmatovsky of Vishy and Vlady. I spotted the picture at a special chess picture exhibition in the “Multimedia Art Museum, Moscow 2012. Vishy Anand (24 at the time) and Vladimir Kramnik (18) played the final in the PCA rapid tournament Kremlin Stars 1994. Kramnik convinced Anand to play the Candidates 2014 at a dinner in London, during the Chess Classic. 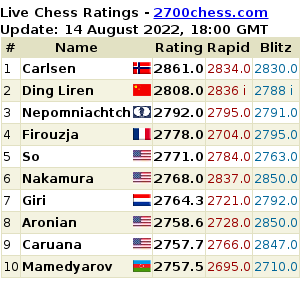 To the other tweets: I already showed a number of “Congratulations Vishy” tweets in the round report of Round 13, e.g. by Garry Kasparov, Ellen Carlsen, Anish Giri and Pavel Eljanov. “A remarkable story of resilience and hardwork. A mark of a true champion. #VishyTheKing“. @fabianocaruana: “Congrats to @vishy64theking on a spectacular win and comeback. Carlsen and Anand’s roles have oddly reversed a year later”. @jonathan_rowson: “Vishy had to be extremely patient for a change in his fortunes. This is a *recovery* though; it’s not yet a ‘comeback'”. @mazetovic: “Congrats to Anand ! We will have an interesting rematch “. @mightysachan: An Inspirational comeback from Vishy after he lost to Carlsen badly at home. He is one of our unsung heroes. @IndiaFiles:Vishy, its been painful for quite a while but you’ve now given us a reason to smile for maybe not all is lost yet. Congrats. @indianwizkid: “Baap baap hota hai” #vishy response to all those who underestimated him”. @rpattabi: “@vishy64theking played and won the candidates after 19 years! What a player beating another generation of top WGMs! Previous PostThe Candidates in tweets – round 14Next PostThe Candidates in tweets – your choice!